Apple’s new, most powerful iMac Pro is finally available for sale, and while some may think its $5,000 starting price is a bit steep, it’s the all extras that will really get you. That’s because when fully loaded with an 18-core Intel Xeon CPU (which won’t even ship until next year), 128GB of error-checking memory, and a 4TB SSD, you’re looking at a total price of $13,199. For comparison’s sake, a brand new Smart Coupe starts at $14,650, while a Honda Fit will run you slightly more at $16,190, and that’s before you figure in any end-of-year discounts dealers are slinging around right about now. Other optional extras include a $79 space gray VESA mounting kit, and pre-installed versions of Final Cut Pro X and Logic Pro X for $300 and $200, respectively. Thankfully, Apple’s first black USB-to-Lighting cord comes bundled with the iMac Pro for free. 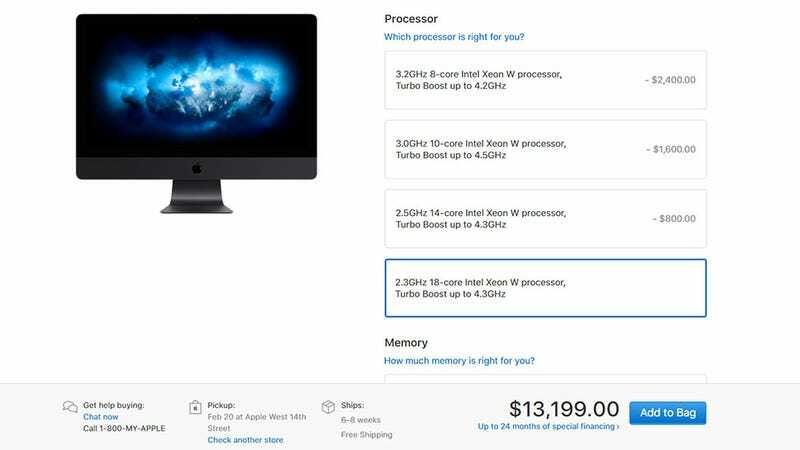 As ridiculous as these prices might seem, it appears that the iMac Pro’s $5,000 base configuration might not be that overpriced. Based on a few comparisons to roughly equivalent Windows systems, the folks over at Apple Insider found that many iMac Pro competitors often costed slightly more than Apple’s new high-end all-in-one, but they weren’t that far off. When it comes to the higher-specced models, however, spending over 10 grand on a new computer just doesn’t seem like a good deal for most people. I guess prices like these are how Apple made $1,444.76 per second in 2017.